I bought this to keep around when the grand-kids come over. We all had a great time playing this. It really was fun! A gift but reading the directions it looks it will be right for the whole family,challenging and fun, wellmade and very colorful! I bought this for my classroom. My students absolutely love it. It's a challenge to be "the last one standing!." By the way, I teach middle school. Bought this for a young family member. He loved the concepts and also that he could beat his brothers. I've purchased this for my classroom and my students have reported LOVING it! This game was loved by an age range of 20-54. It was great friendly competition and provided lots of laughs. I gave this to my 9 yr old granddaughter and she loved it. It is fun to play and my 5 yr old grandson loves to play also. 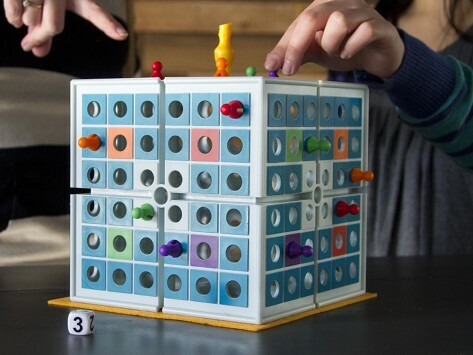 The game is quick, love the idea of storing all the parts in the cube. I bought this for my granddaughter that just turned 7 and she loves it and is also learning how to use some strategy to win. She love's it.